He will earn £135k a year now, plus book royalties. BORIS JOHNSON HAS given up his lucrative newspaper column for the Daily Telegraph. The leading Brexit campaigner was paid £250,000 (€300,000) a year for his weekly article in The Daily Telegraph broadsheet, which he continued writing during his eight-year tenure as mayor of London. In 2009, Johnson described his Telegraph earnings as “chicken feed”. He used the column to make fun of world leaders, but some of his barbs – including comparing White House hopeful Hillary Clinton to a “sadistic nurse” - came back to haunt him when he was named foreign secretary last week. “Boris has been an outstanding columnist for The Daily Telegraph for many years, with a legion of devoted readers,” said Telegraph Media Group editor Chris Evans, adding that he wished him well in his new job. 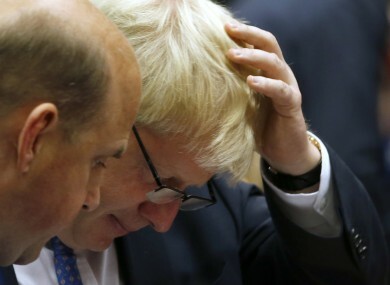 Prime Minister Theresa May, who took office following the June 23 referendum vote for Britain to leave the EU, stunned observers by naming gaffe-prone Johnson as foreign secretary. His new job comes with a salary of £135,527 (€162,307) a year, which includes £74,962 for being a member of parliament. Whilst Mr Johnson has enjoyed a close working relationship with The Daily Telegraph for over 20 years, it would not be appropriate for him to continue writing his long-standing column for the newspaper given his new role as foreign secretary. When asked if May had told Johnson to give up the column, the prime minister’s spokeswoman said it was his decision. Johnson, who stepped down as London mayor in May, was in Brussels on Monday for his first talks with EU counterparts. It was his first trip to Belgium since being Brussels correspondent for the Telegraph. The 52-year-old was also working on a book on Shakespeare that was due to be published in October, but has now been postponed “for the foreseeable future”, publishers Hodder and Stoughton said. Johnson has received an advance payment of around £90,000 for the book, but it is thought unlikely that he will have to repay it as the commission has not been withdrawn. Documents released earlier this year showed Johnson earned £987,097 from his Telegraph column over the past four years, while book royalties brought in a further £469,385. Email “Boris Johnson giving up 'chicken feed' earnings of £250k a year from column”. Feedback on “Boris Johnson giving up 'chicken feed' earnings of £250k a year from column”.